This preserve of puréed pears is simple to make and simply delicious. I’ve made it with Bartlett pears, Seckel pears and even Asian pears, and it’s always a delight. 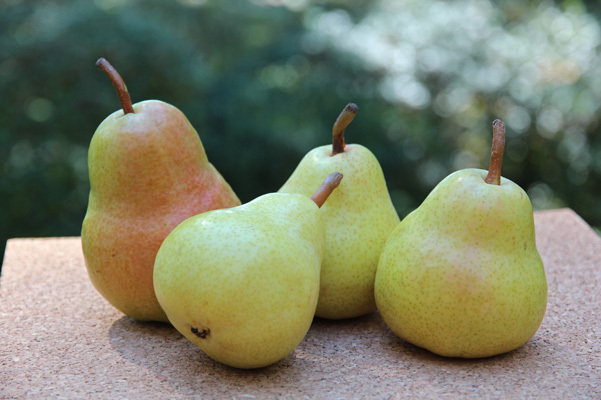 Pear jam is a good use for pears that are slightly overripe. Combine the pears and lemon juice in a preserving pan, cover the pan, and set it over very low heat. Simmer the pears, stirring occasionally, until they are very soft, 20 to 30 minutes. Press the pears with the juice through the medium screen of a food mill, or puree them in a food processor or blender. Return the pear puree to the pan and stir in the sugar. Over low heat, stir until the sugar dissolves, and then raise the heat to medium-high. Bring the mixture to a boil and continue to boil it, stirring constantly, for about 15 minutes, until the jam falls heavily from a spoon and a drop of jam mounds in a chilled dish. Remove the pan from the heat and stir until the bubbling stops. Ladle the jam into pint or half-pint mason jars and add lids and rings. Process the jars for 10 minutes in a boiling-water bath.